I am not a lover of traditional Tiramasu, but this version is absolutely delicious. I gave the recipe to a friend of mine recently who wanted a large pudding for guests coming for lunch. 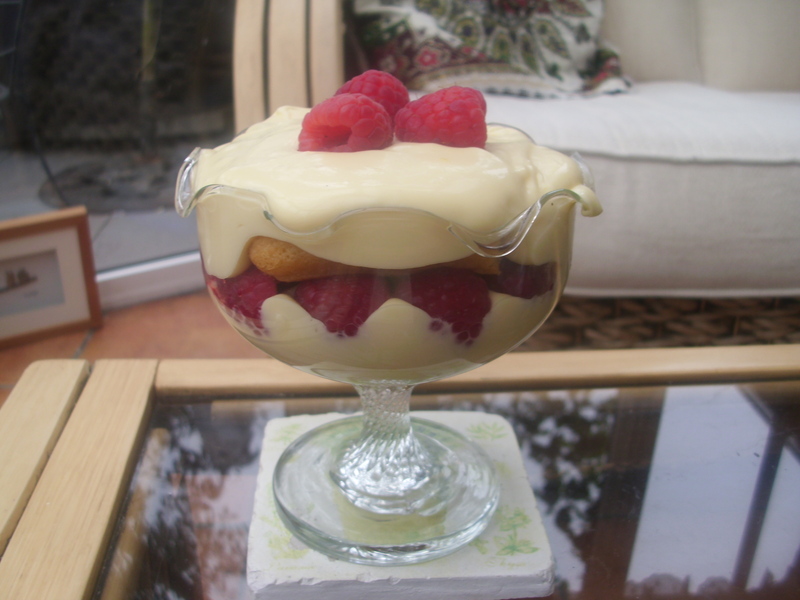 This is a large pudding and a little goes a long way as it is quite rich. He made the pudding and all his guests were ecstatic. From what he said I think he will be making it again in the future by popular request. Well, here is the recipe. I didn’t have any Grand Maniere when I made this so substituted half and half brandy. It was delicious. Place a heatproof bowl over a pan of simmering water. In the bowl, whisk the egg yolks and caster sugar together until pale, creamy and doubled in volume. Remove from heat and whisk for 1 minute to cool. In another bowl beat together the cream, mascarpone and vanilla extract until combined, thick and creamy. Fold into the creamy yolks. Combine the orange juice and Gran Maniere then dip in half of the sponge fingers and arrange over the bottom of a serving dish. Pour over half the creamy mixture then top with most of the raspberries (reserve some of the best for decorating the top). Repeat layers finishing by decorating the top with raspberries. I love Chinese food. Come to think of it, I love most food, which is why I will never be anorexic! Still, Chinese food is one of my favourites, and Sweet and Sour dishes are usually my choice off the menu when we eat out. 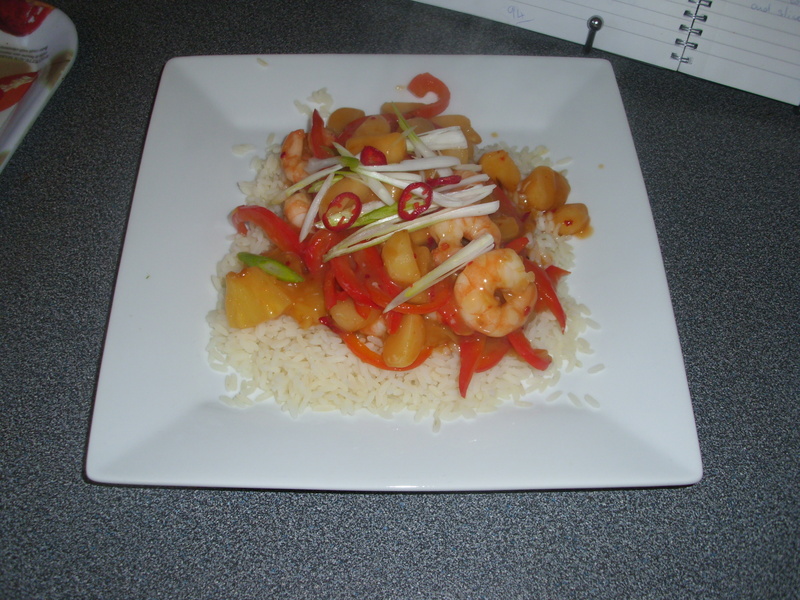 Last night I made an old favourite, Sweet and Sour Prawns. Terry, my husband, always insists that he hates sweet and sour dishes. The fact that he did not leave even one grain of rice on his plate says everything about this recipe. Another thing that amazes me is that it didn’t make my husband sneeze!! He always sneezes when we go out for a Chinese meal. I wonder if it is the monosodium glutamate? Sweet and Sour sauce originated in China, particularly in the North-east of China. It is cheap to make and, because of this, it is sometimes known in China as the people’s sauce. This local name probably reflects the fact that it was once, distributed by the Chinese Communist Party during the Cultural Revolution. Often, in China, this is a dipping sauce rather than one added to the wok to produce a dish we are familiar with in the UK. Perhaps one of the most famous exceptions to this is Cantonese Sweet and Sour Pork. I love this recipe. I think it’s the fact it includes chillies. They give the dish a heat that enhances the flavour in a spectacular way. It is quick and easy, and only contains 161 calories! I served it with plain boiled rice but I think it would be good with noodles as well. Give it a try, but be warned, you may find you will be disappointed afterwards if you choose this at the local Chinese restaurant! The recipe is from the Delicious Website. I have included my own photographs to demonstrate each step. My advice would be to prepare everything before starting to cook as the cooking time is less than 10 minutes altogether, so there is very little time to waste if you don’t want to overcook the ingredients. Here we are again with leftover roast chicken. I thought, this time, I would make a chicken pie. 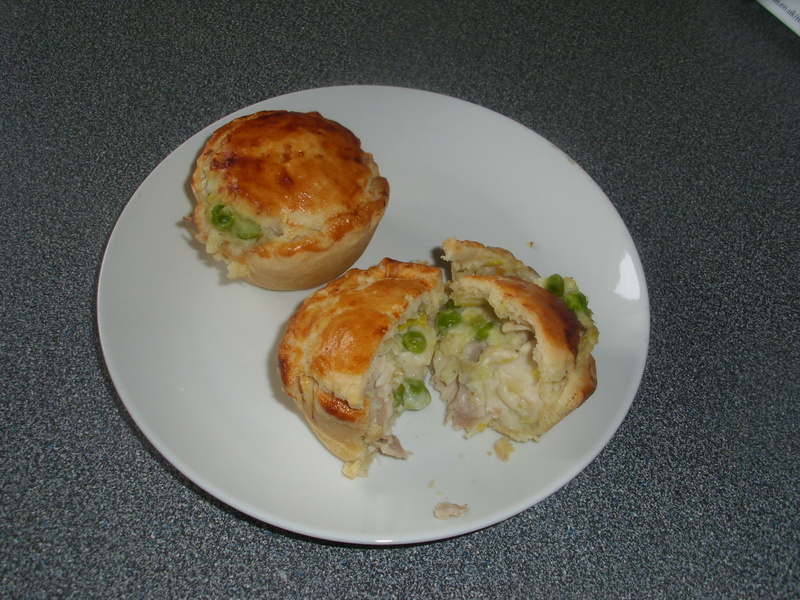 I wasn’t sure what to put in the filling but I know leeks go well with chicken, as does tarragon, so I decided to include those in the ingredients. The other consideration was the calorie content. As you may remember, I am trying to watch what I eat in a hopeless attempt to lose weight, or at least not to put any more on! If I make a large pie I know we will keep eating it until it is all gone. So I decided to make small individual pies. I was so pleased with the end result. I’m sure these would freeze well, uncooked, but I made the mistake of putting them all in one muffin pan so I’m going to try freezing them cooked and see how they turn out. That is if I can stop my husband, Terry, from eating them! These are perfect for a picnic. There is something so very English about picnics. Mrs Beeton certainly thought so, although I think you would need a lorry to carry her idea of a picnic ie it should contain no less than 35 different dishes. I’m not sure how many guests she had invited. “The Rat brought the boat alongside the bank, tied it up, helped awkward Mole safely ashore and swung out the picnic basket. The Mole begged to be allowed to unpack it all by himself. He took out all the mysterious packages one by one and arranged their contents, gasping ‘Oh my! Oh my!’ At each fresh surprise”. Anyway, here is my recipe. I hope you enjoy them as much as we did. Preheat an oven to 190c/180c fan/gas 5. Melt the butter in a saucepan, add the leeks and saute gently for about 10 minutes until soft but not discoloured. Stir in the flour and cook for about 1 minute over a low heat. Gradually add the milk, stirring between each addition to prevent curdling. Cook over a medium heat, stirring, until the sauce is thickened. Add the tarragon, and season with salt and black pepper. Mix well. Add the chicken and peas, stir so they are evenly distributed. Remove from heat and allow to cool. Roll out the pastry and cut out circles large enough to fill a muffin tin with a little overhang. Fill the pastry case to just below the top. Brush edges with beaten egg. Place lid on top and tuck in around the edge. Bring over the overhanging pastry to ensure the contents are secure. Brush tops with the beaten egg. Bake in oven for 30 minutes. Remove from oven and leave in tin for a few minutes. Remove to a wire tray. Serve immediately for hot or leave to cool. Good either way. I love the flavours of Thai food. The freshness of the limes and lemongrass and the warmth of the chillies. This curry is slightly different as it has added depth by the addition of curry powder. 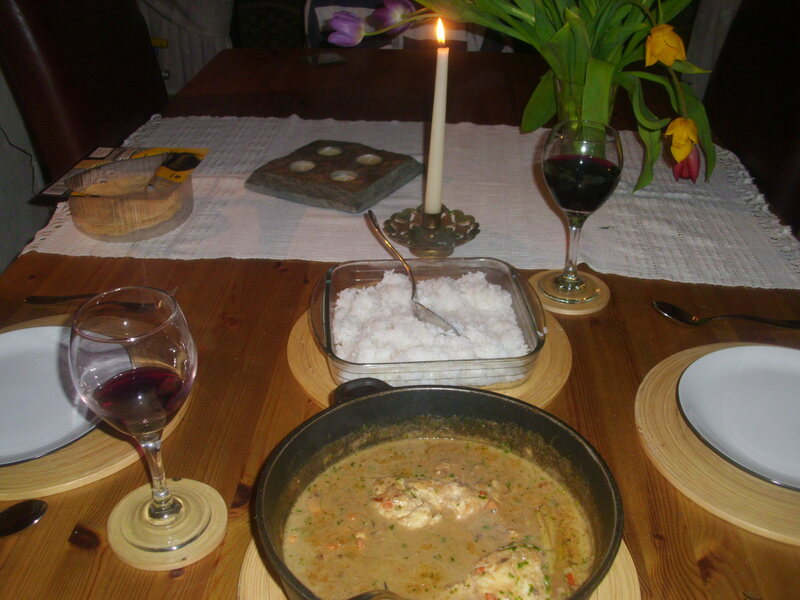 The end result is a fragrant curry that is not too hot. It is really easy to make and, as the sauce is made first, you can make this in advance and either finish it off when you are ready to eat or freeze for another day then thaw and continue by adding the fish when the sauce has heated up. This flexibility makes it a great dish to come home to after work or for a dinner party when you can use the free time to socialise with your guests. Heat the oil in a large frying pan or skillet and fry the onion until softened, about 5 minutes, over a medium heat. Stir in the ginger, garlic and shrimp pastes and the chilli and lemongrass. Cook over a low heat for 1 minute, stirring so it doesn’t burn. Add the curry powder and sugar. When the sugar is melted add the coriander stems, coconut milk and 2 tbsp water then bring to a simmer. You can freeze at this stage if you want to. Add the fish and the prawns to the sauce then squeeze over half the lime juice. Cover and simmer for 7 minutes until the fish is cooked through and the prawns are pink. Taste for seasoning and add a little more lime juice if you like. Scatter with the coriander leaves and serve hot with boiled rice. 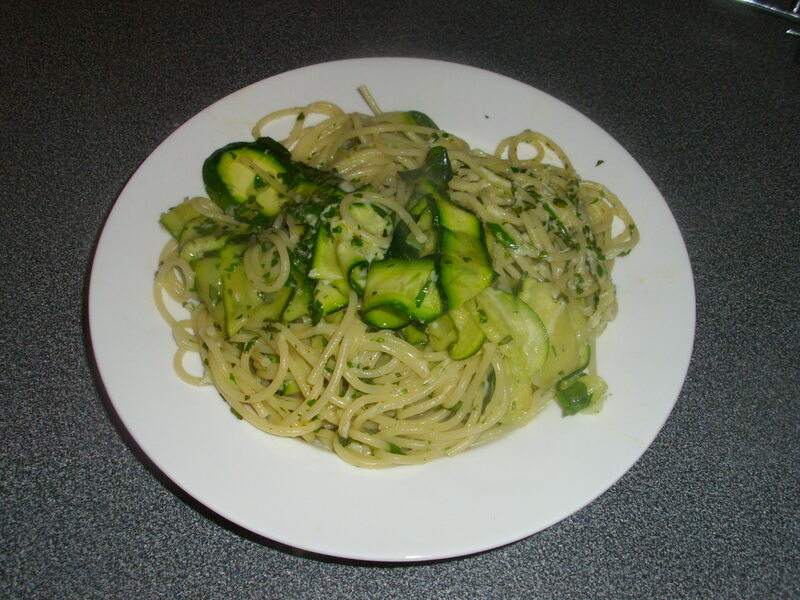 Courgettes with pasta, my favourite pasta dish! There was a time when I hated courgettes but, over the years and after trying so many delicious recipes, that has all changed. I love it when there is a glut of courgettes in the shops but, thankfully, you can now buy them all year round. When we had this recently it reminded me how much we love it, and how long it had been since we ate it! I can’t remember when we first had this dish, it must be at least five years ago. I think our first time was because someone had given us a bag full of courgettes, they were not a vegetable I would have actually bought in those days! The recipe would probably have come from one of the cooking journals I subscribe to and, if I remember, the picture did not look that tantalising. I am so glad we tried it though. Sometimes you come across a recipe that you want to make time and time again. This is one of those times! We absolutely love this pasta dish. You would not believe how fresh it tastes or how much flavour it packs in. Before the recipe though, I thought I would look at some food trivia on Parmesan Cheese. I can remember, many years ago, buying Parmesan cheese already grated and served in little tubs. It was disgusting and smelled of sweaty socks. Yuk!!! The first time I bought fresh Parmesan I could not believe the flavour. It is so strong, absolutely beautiful. It really makes you wonder how they manage to transform such a great taste to an imitation of sweaty socks!! A lot of people will not buy the fresh cheese as it is expensive and they may only use it occasionally. Believe me, it is worth the expense! I grate the whole block at a time and freeze it in a well sealed freezer bag. That way I can take out just as much as I need when I need it. I even freeze the rind, it gives a great flavour to soups! Parmesan cheese is the French name given to Parmigiano-Reggiano, and one that most of the UK have adopted. Parmigiano-Reggiano is a hard, granular cheese that is cooked but not pressed, and is produced in Italy. The name is protected under European Law and can only be given to the cheese produced in specified regions of Italy. Informally it is often called the ‘King of Cheese’. The cheese is made out of cows milk and any left over whey is used to feed the pigs from which Parma Ham was produced. Great bit of recycling!!! The cheese is as pure and organic as possible. Cows can only feed on grass or hay, giving grass-fed milk, and only natural whey culture is allowed as a starter. The only additive allowed is salt which the cheese absorbs while being submerged in huge vats of brine made from Mediterranean sea salt, before being left to age for an average of two years. The end result is a fantastic cheese with a deep, savoury flavour. It is very strong so, although expensive, you only need a small amount yet still get the full flavour coming through. Anyway, I’ve tried to trace the recipe to a website and failed so I have written it out for you below. I really hope you give it a try, I am sure you will not be disappointed. Meanwhile, heat the olive oil in a large frying pan or wok. Add the garlic and cook gently for a few seconds until it becomes fragrant. Be careful not to let it burn or it will be bitter. Tip in the courgettes, stir to coat in the garlic oil then cook gently for about 4 minutes. They need to be softened but not soggy. Drain the spaghetti and add to the courgettes, along with the butter, cheese and herbs. Toss them gently until the butter has melted, the spaghetti is coated with the cheese and herbs and the courgettes are evenly distributed. Season to taste and serve immediately. You can drizzle with a little extra olive oil if you like. OK, so all my followers will know by now that I love Chinese food. 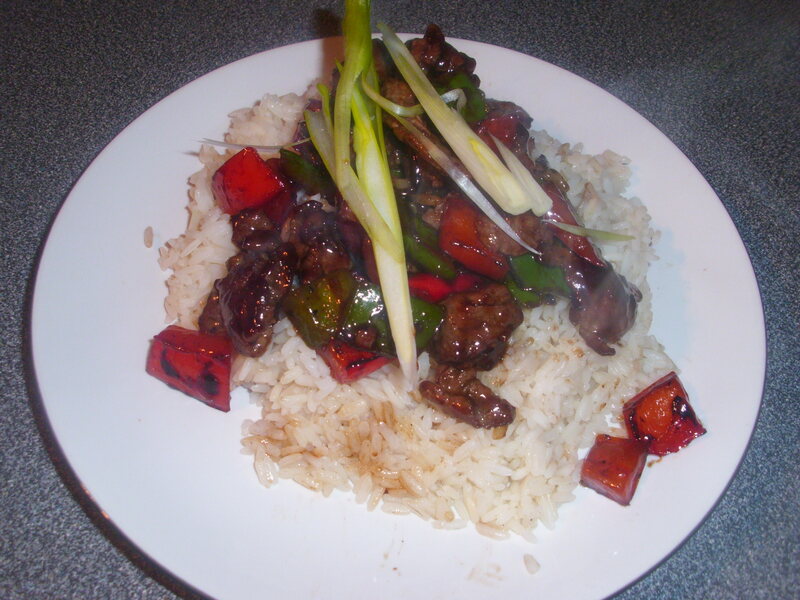 I also like Ken Hom recipes so this dish was a reasonably safe bet to turn out well. I was not disappointed. Mind you, I did go all out with the beef and bought fillet steak. Some may think this was a waste but my husband is really fussy about meat and hates chewy bits in recipes where the meat is in a sauce and so they are well disguised. This beef just melted in our mouths and was absolutely delicious. In actual fact, there wasn’t that much difference in the price of the fillet to other steaks so I feel my choice was justified. Another essential is your choice of oyster sauce. Some oyster sauces taste fishy so buying the best you can afford always pays in the end. Ken Hom recommends Lee Kum Kee sauce found in most major supermarkets. The dish is very savoury so goes well with plain boiled rice. Lamb Tagine – prepare ahead for an easy life! I picked up a leg of lamb today. half price. from the supermarket and I am going to make a Lamb Tagine. The recipe looks easy enough and I can prepare it ahead. I think it will actually improve with standing and it will give me a chance to use my new Tagine pot! Lots of good reasons then to make it. Tagine is a dish from North Africa, named after the earthenware pot it is cooked in. 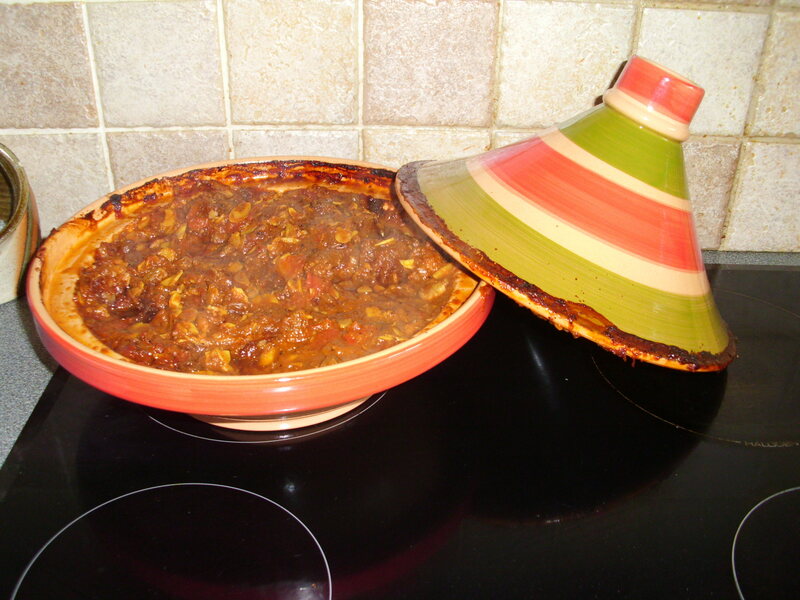 The traditional Tagine has a flat circular base with low sides and a dome-shaped top. The top is shaped like this to allow the steam to condense and return to the stew below, keeping the moisture in. There is a knob at the top to facilitate easy removal of the top to allow additions to the stew whilst it is cooking. Moroccan tagines are slowly braised at low temperatures. This results in meltingly tender meat in aromatic sauces. This cooking process is ideal for cheap cuts of meat so many recipes will use cheap cuts of lamb or chicken. You will often find they include sweet ingredients such as dried fruits, preserved lemons and honey. They will always, however, include spices, traditionally these will be a mix of cinnamon, ginger, turmeric and paprika. I used a leg of lamb, boned and cut into cubes, because my husband hates fat or chewy lamb. The cooking time was almost halved, but I have kept the recipe as intended, ie, using cheaper cuts of lamb. For years I would avoid cooking this meal. I am not a lover of stews that combine meat with dried fruit and nuts. What a fool I was! The end result is absolutely gorgeous!! Tagines are usually served with couscous. I have never had any success with couscous and usually find it bland and tasteless. This time I cheated and gave a ready mixed Moroccan couscous a try. All I had to do was add water and it was delicious. I may have a go at making my own like this another time. If you don’t like couscous, try serving it with rice or Orzo. I’m sure these would be just as good! Heat oven to 170C/150C fan/gas 3.Mix the spices together in a small bowl then add to the lamb, mixing to coat well. Heat 1 tbsp oil in an hob to oven casserole on a high heat. Brown the lamb in batches so as not to overcrowd the pan, adding extra oil for each batch. Turn down the heat to low and add the remaining tbsp oil. add the onions and cook until softened but not browned. Add the garlic and salt towards the end of cooking. Return the lamb to the casserole and stir in the remaining ingredients. Bring to the boil and transfer to a tagine or cover the casserole and cook in the oven for 2 hours or until the lamb is meltingly tender. Check occasionally and stir to ensure it is not drying out. Serve sprinkled with the coriander.